We have been working hard over the past few weeks to get out lounge ready for Christmas, although I am afraid you have to wait for the full tour as the lounge is now filled with Christmas decorations! 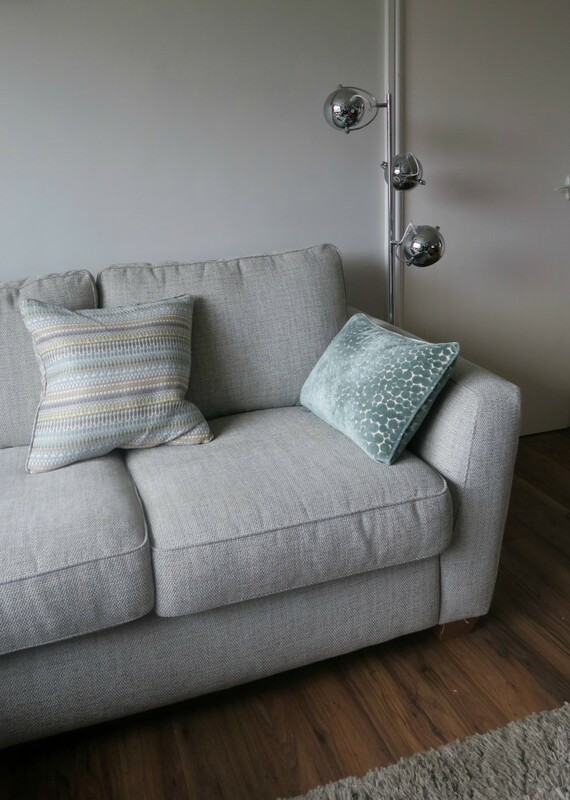 We have recently purchased a new corner sofa, this means we needed to re think our lighting. As a Value Lights ambassador I knew I would be able to find something with them that worked well for our room. As you can see I choose the Retro Style Eyeball 3 way floor lamp in chrome, I wanted something that fitted neatly behind the door to give some light to this end of the sofa. 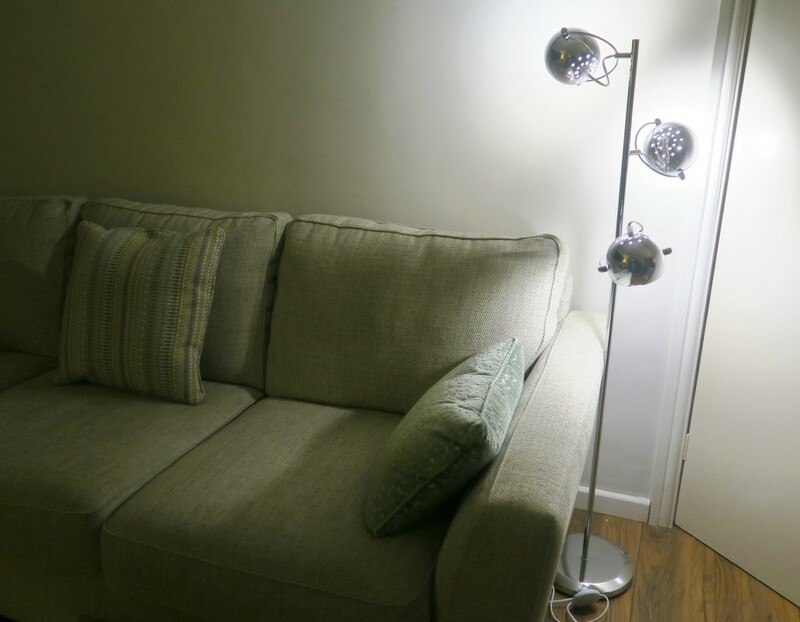 It is quite a dark end of the sofa as the other light is right in the other corner, so this modern light with 3 lights on the stem worked great. 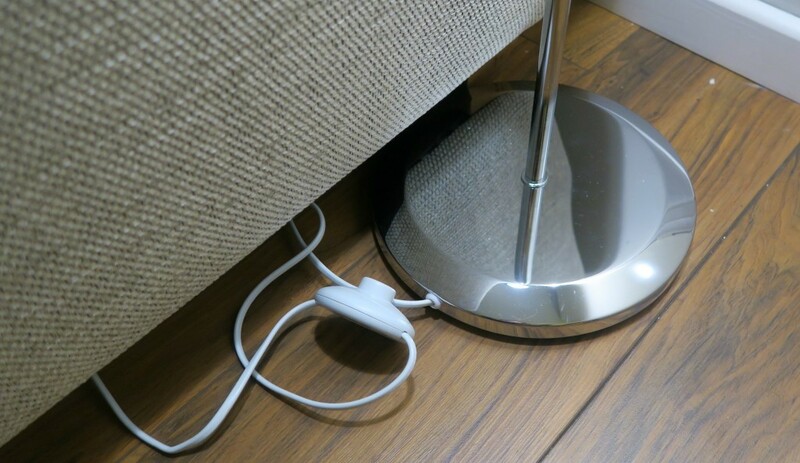 It has a long cable which I have tucked under the sofa, but with the added extra of a foot button to turn it on. This is perfect for a floor lamp. The base is a decent weight so it isn’t knocked over easily, and a long thing stem which is approx 1300mm high. 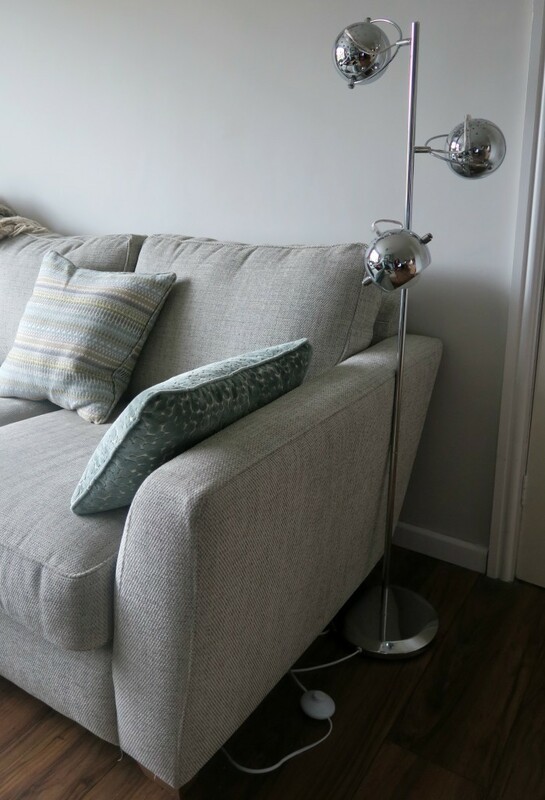 The height of this floor lamp is perfect, some floor lamps are very high or touching your head! This one sits nicely over the sofa, which gives you great light for reading, or completing crosswords like my mother in law will be doing over the Christmas period! Each eye ball light is flexible in which direction you would like the light to point to. The eye ball pivots and then the whole eye ball twists from the main stem. You have the choice of purchasing bulbs at the time, either daylight bulbs or warm light bulbs. I was sent daylight bulbs in mine, they are super bright and a very white light. It gives a lot of light off but can be quite glarey. 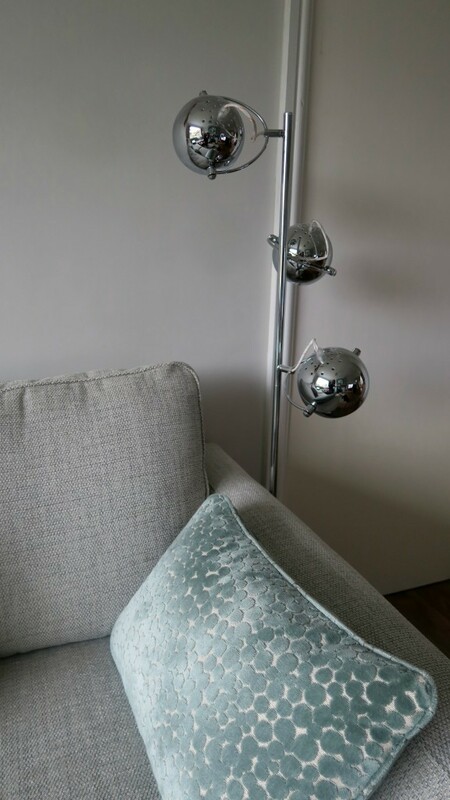 I am really pleased with this floor lamp, it is of great quality and looks really stylish in my new room. Priced at rrp £49.99 but on sale at £39.99 at the time of writing this, and also free delivery on orders over £35. 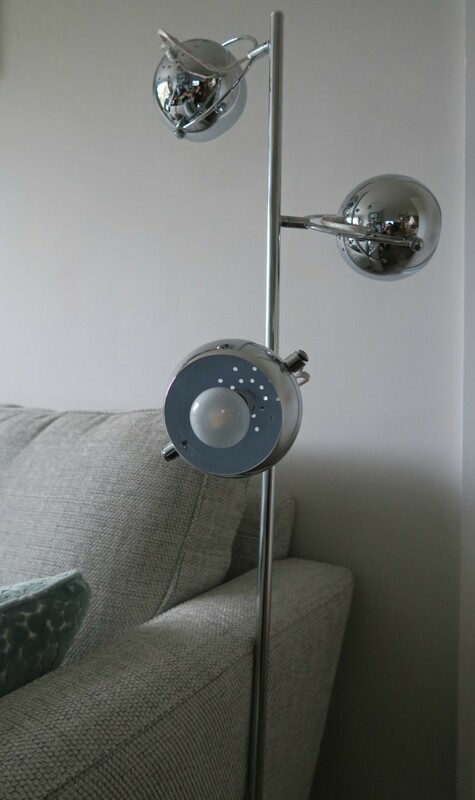 *I was sent this floor lamp for the purpose of this review, however all opinions are honest and of my own. Color of the Sofa is really suitable with the lamps. Nice idea. Such an edgy looking floor lamp. And it goes really well with your new sofa too! They look almost space-age. What a cool choice! I need to look for something similar. The side of the sofa that I like to sit and read on is pretty dark but I’m not quite sure what I want yet. My son use to have a disco ball! They are very modern looking aren’t they!